Okay, we have certainly gotten past the premise that technology itself holds answers for education. As we know, it is technology’s ability to save teachers time or focus student attention that can be advantageous. Recently, THE Journal went a step further calling for less attention to technology and more to curriculum. I agree completely however not all students need the same instructional material at the same time. I wonder what teacher has the time to deliver individual lessons to different students for each objective she teaches and for the below grade level lessons she does not. So, how can technology improve curriculum? One of the most important benefits of technology is its ability to help with classroom management, simply put, one teacher trying to see to the needs of numerous students. When each of these students has individual skill gaps, that challenge becomes even more daunting. No teacher can be expected to handle truly individualized instruction for more than a few students without help. And individualized instruction is so often needed when students fall behind in math or are ready to move ahead. Technology can do this by properly assessing each student’s needs and then automatically assigning the appropriate aligned curriculum. Bottom Line: It’s not about having technology. It’s about delivering the right instruction to the right student at the right time! Ascend Education announced today that a record 32 schools are being recognized as Gold Medal schools this year. The Gold Medal Award was established in 2010 to honor the schools or districts that best demonstrate a dedication to ensuring that all students become successful at math. The Gold Medal nominees all used Ascend Math to supplement their math instruction to achieve results better than they would in the normal classroom environment. All 32 Gold Medal schools or districts will receive an award commemorating their success. This is, in a word, ridiculous. It doesn’t have to be expensive or hard to implement a truly individualized program of math instruction. The concept is simple really: 1. Assess 2. Provide Instruction 3. Verify Mastery 4. Assess again! Okay, but let’s be specific about what we are assessing. Too often, assessment of math skills is reserved for on level. Far too many students have skill gaps several grades below their current level. Too assess properly the functional grade level must be ascertained first. Then the student must be quickly assessed on each skill in that functional grade level to determine where the student needs instruction. An effective assessment and instructional math program that provides truly individual study plans for each student can be very easy for a teacher to implement. Also, it should cost no more than a small fraction of the amount mentioned in the Education Week article. We continue our series of fun March Mathness problems this week. Here are two that were submitted for the Final Four. Gonzaga and South Carolina will play each other in the Semi-Final on Saturday. In the last round Gonzaga beat Xaviar 83 to 59. South Carolina beat Florida 77 to 70. Determine how many points each team won by. Which team won by the greatest margin? In Oregon’s win over Kansas Saturday, Tyler Dorsey made 9 out of 13 field goals. Kansas starter Frank Mason III made 8 out of 20 field goals. Determine the field goal percentage for each by dividing 9 by 13 and 8 by 20. Who had the better field goal percentage? The teams that made it to the Sweet Sixteen are very different. Some have posted high scores in post season, some low. But they are all winners. Can you find the mean, median, and mode for points scored per game by the teams in the Sweet Sixteen? 1. NBA games have 4 12-minute quarters. College games have 2 20-minute halves. Which games are longer, NBA or College, and by how much? 2. The tournament started with 64 teams. Of those, 48 have been sent home. How many teams are left? 3. College players use a basketball that is 9.4 inches in diameter. The hoop is 18 inches in diameter. If a ball passes exactly through the center of the net, how much space will there be between the edge of the ball and the hoop? Check back regularly for more March Mathness problems. I am from Minnesota and yes, I am a graduate of the University there. And I am upset. I’m upset at the upset of the #5 seeded Golden Gophers at the hands (large hands) of the Middle Tennessee State Blue Raiders. It was one of two upsets in the first day of the tournament. It won’t make me feel any better but let’s do the math anyway. Xavier 76 over Maryland 65. Which team won by the most points? What was the average of points put up by the losing teams? What was the average points put up by the winning teams? As we prepare for the actual games, some folks out there are having special fun with the 68 teams. 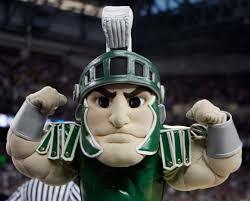 USA Today presents a ranking of the teams according to their team name and mascot. We figured why not add a little math to that fun. What is the ranking for the Virginia Cavaliers? What is the ranking for the Maryland Terrapins? What is the difference in their rankings? 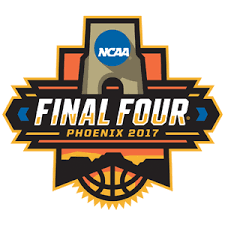 Which of these teams is ranked in the top 25%, Oregon Ducks, Minnesota Gophers, Michigan Wolverines, North Carolina Tar Heels? If names alone show strength and speed we like 1. Wake Forest Demon Deacons, 2. Notre Dame Fighting Irish, 3. Xaviar Musketeers, and 4. Seton Hall Pirates. What is the average of their rakings? 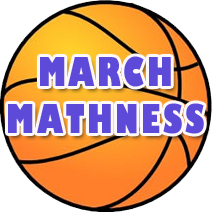 Some of the most popular posts of the past three years have been those celebrating March Mathness, the math behind the sport of basketball! Many of you sent in your own math problems for posting. These included scores, records of teams, distance teams have to travel, the basketball court itself, even the numbers on the player’s jerseys. Math plays into this annual event in more ways than you might think. 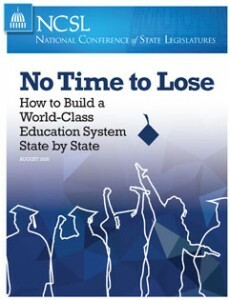 A recent study by the National Conference of State Legislatures has concluded that world-class education systems have a few common elements that we can learn from: a strong early education system, a high-quality professional teacher workforce, robust career and technical education programs, and strong alignment between K-12 and college/career goals. These common strengths have parallels in the business world as well. Having a strong education system for a new employee during the first months is critical. Ensuring the best onboarding experience pays dividends years and sometimes even decades later. A high quality workforce is our biggest asset. We’ve all heard it. Hiring is the most important business decision we will make. Still, the process is too often rushed or compromised. Start by knowing what qualities are truly needed for the position and perform a rigorous, in-depth interview of any final candidates. Always check references meticulously. What work’s best for students who are preparing to enter the workforce also works best once they are there. Your team needs a robust education program in the form of ongoing personal and professional development. Every employee must know how his or her actions fit into the mission and culture of our company. Share your vision consistently so your team knows how the strategic plan relates to their personal objectives. In many ways, the best education systems are following a path blazed by the best companies in the world.